Dr S.M. Gon III wrote in 2007 in his award winning web guide to Trilobites about the Emu Bay Shale, Australia. Here are some quotes from his text. The Emu Bay Shale is a geological formation in Emu Bay, South Australia, containing a major Konservat-Lagerstätten (fossil beds with soft tissue preservation). 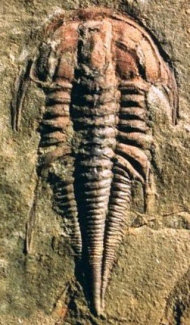 It is one of two in the world containing Redlichiidan trilobites. The Australian's Emu Bay Shale correlated with upper Botomian Stage of the Lower Cambrian. Its mode of preservation is the same as the Burgess shale, but the larger grain size of the Emu Bay rock means that the quality of preservation is lower. The Emu Bay Shale Formation of Kangaroo Island, South Australia is Australia's only known Burgess-Shale-type Konservat-Lagerstätte, and includes faunal elements such as Anomalocaris, Tuzoia, Isoxys, Xandarella, and Primicaris, in common with other Burgess-Shale-type assemblages, particularly the Chengjiang Fauna in China, the closest palaeogeographically, although somewhat older. Balcoracania and Emuella are members of the distinctive redlichiine superfamily Emuelloidea, known for numerous segments (over 60 in large Balcoracania specimens), and so far entirely restricted to Australia. Mr Adam the Paleobiologist at work! He is busily labeling the creatures God has brought to him for identification and naming and is setting them into a relational network which is actually the good old Aristotelian hierarchy tree - the simple and powerful core of all scientific research: classification! The depositional environment of the majority of Burgess-Shale-type assemblages is outer shelf, deeper water. The Emu Bay Shale in contrast, appears to represent relatively shallow water deposition, indicating that soft tissue preservation occurred in a range of environmental settings during the Cambrian.